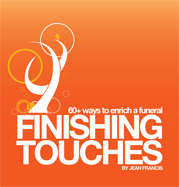 60+ ways to enrich a funeral, at little or no extra cost. (A pocket sized book). This book will answer many questions and spark the imagination of those planning their own funeral or the funeral of a loved one. £5.00 including postage for UK buyers. (Not in the UK? Please order here instead). 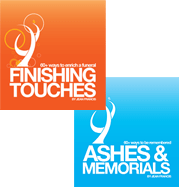 Ashes & Memorials, 60+ Ways to be Remembered. 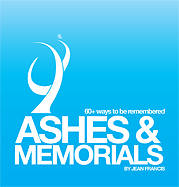 This book informs readers of the many ways in which cremated ashes can become lasting and imaginative memorials. £5.00 including postage for UK buyers. (Not in the UK? Please order here instead). Purchase both books together (for descriptions see above). £8.50 including postage for UK buyers. (Not in the UK? Please order here instead). 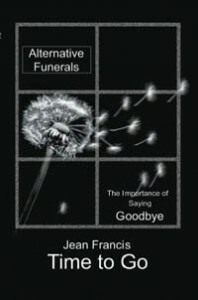 This book offers choices that will enable you to plan farewell ceremonies where life and death are interwoven.It provides snapshots of woodland burials, funerals that encompass different religious beliefs or none at all; traditions and rituals from around the world as well as many customs. 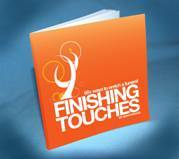 £9.95 + £2.50 postage for UK buyers. (Not in the UK? Please order here instead). 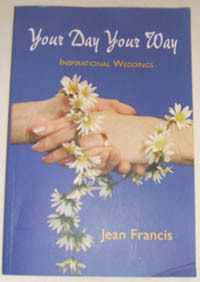 Packed with ideas and tips this book is an invaluable guide for anyone wanting to make that special occasion a truly memorable event: £8.99 + £2.50 postage for UK buyers. (Not in the UK? Please order here instead). Postal charges quoted on this page are for UK deliveries only. For overseas, please order via Amazon.